Our Amish Paneled Mission Recliner Loveseat Sofa is ready to bring durability, comfort, and quality to your living room. Featuring paneled, solid wood sides, versus the horizontal siats you often see in mission-style furniture, this sofa also includes beautiful corbel details and slightly arching solid wood arms for extra comfort. Top quality cushions and a reclining function offer comfort after a long day, or a relaxing way to start out the day. Available in quarter sawn white oak, oak, brown maple, or cherry, select from a variety of stains and upholstery fabrics to make this transitional mission-style loveseat yours. Looking for the slatted version of this recliner? 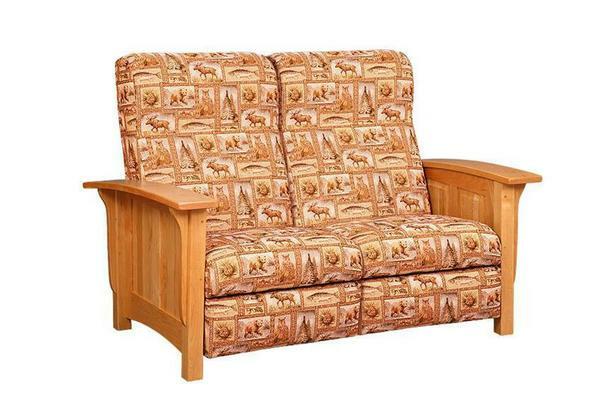 Check out our Amish American Mission Reclining Loveseat. Note: Customer can provide own fabric or leather. Call for more information. 6 yards of fabric or leather is needed.